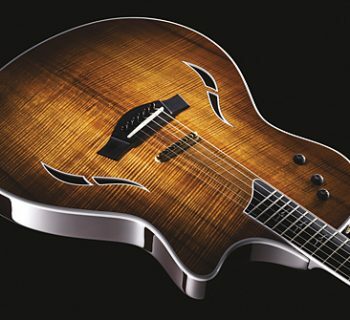 Tube Power Amp Modeling, Speaker Cabinet Modeling, Mic Modeling, and more. The Torpedo VM-202 is a unique product well suited to both the recording studio as well as the live guitar rig. In this two-channel box you’ll find outstanding tube power amplifier modeling, speaker modeling, and microphone modeling, all designed to be paired with your favorite guitar or bass preamp for direct recording or connection to a sound reinforcement system. Capable of emulating multiple popular amp topologies and tube types, the VM-202 is the real deal (as far as modeling technology goes) — it sounds and responds to the tube power amp of your choice, and if you’ve got a great preamp like an ENGL e580, Mesa/Boogie Triaxis, Marshall JMP-1, or the likes, this combination will let you record or practice with great tube tone at headphone levels. In the live setting, the VM-202 will enable you to go straight to the mixing desk without miking a cabinet, ideal for in-ear monitor users. Even when paired with your favorite traditional amp, the VM-202 provides great options for live use as an amazing cabinet simulator — just bypass the power amp modeling and use the fantastic cabinet and microphone modeling. 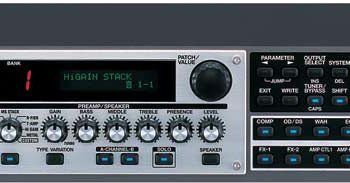 The VM-202 has a straightforward though slightly awkward user interface, but if it’s not easy enough for your tastes when designing the signal chain of your dreams, the included software editor brings all functionality to the comfort of your computer screen. 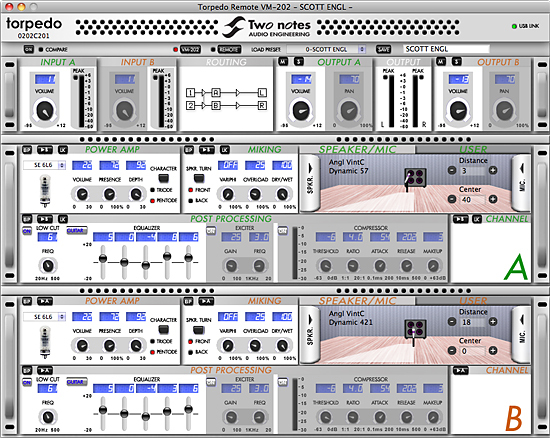 And if the speaker cabinets aren’t to your liking, studio geeks can rejoice: Two Notes supplies software for capturing impulse responses from your personal speaker cabinets and loading them into the VM-202. We’ve seen quite a few new products that are blurring the line between the worlds of physical tube amps and modeling solutions that sound good enough for purists. Two Notes makes a few different products to serve tube fans, and the VM-202 holds a unique place in the market. There is no other product available specifically focused on tube power amp modeling, but fortunately, if you’re in need of this special device, it does a great job. • VB-101: Load box and speaker/mic simulator. For up to 150 W output at 8 ohms, plug your amp into the VB-101 instead of a speaker cabinet and run the output to mixing boards, PA systems, DAWs, etc. Crank it up and record while your apartment neighbors sleep soundly. • LB-202: Load box and power attenuator. Use this in-line between your amp’s output and speakers to push your amp’s power tubes at reasonable volume levels. Because it is a load box, you can use it without a speaker cabinet and jam with a set of headphones. Two channels make it a great match for rack-mounted stereo power amps, too. • PI-101: Software plug-in version of the VM-202, provides power amp modeling, speaker modeling, mic simulation. A free version, PI-FREE, is fully functional, but just has a single power amp, speaker, and mic for you to put to the proverbial test. The subject of this review, the Torpedo VM-202 replaces your guitar amp (its power amp, specifically), speaker cabinet, microphone, and preamp to deliver a simulated tone suited to recording, rehearsing, and performing without a miked cabinet. Actually, double that. With two ins and outs, it’s twice the goodness in a single box. This design is ideally suited to guitar and bass players with rack-based rigs featuring preamps like those from ENGL, Mesa/Boogie, Egnater, Randall, Marshall, Eden, SWR, and many others, but it’s also a convenient product to use with traditional amps, provided that they incorporate an effects loop or other side-chain output (more about this in Usability). Amp topologies simulated include 6L6, EL34, EL84, and KT88 power tubes in both Class AB (Push Pull) and Class A (Single Ended) configurations. You can also specify pentode or triode operation. The amps each provide a master volume, Presence, and Depth controls. Over thirty popular speaker cabinets are modeled including 2x12 and 4x12 guitar speaker cabinets from Fender, Marshall, Mesa/Boogie, ENGL, VHT, Hughes & Kettner, and Diezel, among others. Bass players are provided with cabinets in popular sizes such as 1x15, 4x10, and 2x10 from SWR, Ampeg, Eden, Markbass, and more. For a complete list of guitar and bass cabinets modeled — and mics, click here. And if the options aren’t exactly what you need, just load your own! Torpedo Capture software (free download) enables the studio engineer among you to capture impulse responses from your personal speaker cabinets in the studio for use with the VM-202. Microphone choices are equally top flight: Shure SM-57, Neumann U87, Royer R121, Sennheiser MD421, Shure Beta 52, and others. You can adjust distance to the cabinet, axis, and front/back placement. Post-input effects include a five-band EQ (different frequencies based on a guitar/bass selection), low-pass filter, exciter, and compressor. Each can be independently inserted or bypassed. The VM-202 features mono or stereo inputs and outputs. The inputs and outputs are both on balanced XLR jacks, so you’ll need one or two TRS-to-XLR balanced cables to connect your typical guitar preamp to the VM-202. These are line-level conenctions, so don't stick a DI in front of it! We would prefer a combination Neutrik connector or simply a pair of ¼” TRS jacks for the input from guitar preamps, but it's certainly not a show-stopper. 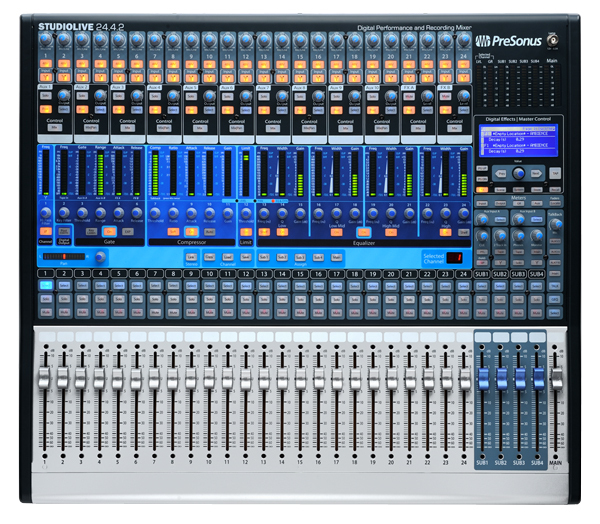 The output side makes sense as a balanced XLR solution. Mono and stereo input/output configuration is possible, as well as dual mono. With dual mono operation, you can configure the VM-202 for use with two different preamps, perhaps setting it up in your studio for one guitar rig and one bass rig. Of course it has onboard memory for 100 settings, so you can easily pair your preamp with different amp and mic settings for a wide array of tones. The A/D converters are 24-bit/192 kHz, and you can connect the VM-202 in your studio via digital AES/EBU or S/PDIF. Even if the output is running at a lower value (like 48 kHz), all internal operations are performed at 96 kHz/32-bit, and external clock sync up to 192 kHz is supported. A USB port provides computer connectivity for running Torpedo Remote software, which gives you full-screen tone-shaping control over your sounds. MIDI In and Out/Thru jacks let you connect to MIDI foot controllers and other assorted MIDI gear. Virtually every parameter in the VM-202 has assignable control via MIDI continuous controller messages, and up to 100 presets can be saved internally. MIDI program change messages enable instant preset selection from various controllers. Getting up and running with the VM-202 only took us a minute or two since we had easy access to dedicated preamps (ENGL e580 and Mesa/Boogie Triaxis) and a set of headphones. Output to our mixing board was helped only by the fact that we had a pair of TRS-to-XLR cables laying around in the bottom of a miscellaneous cable box in our studio. If you’re a typical guitar or bass player with a home studio, be sure to get a set of these cables, or a pair of high-Z/low-Z cable adapters to use with your standard mic cables. In order to use the VM-202 with your traditional amp, there are a few options for connectivity. One possibility is to run a signal from the effects loop Send to the VM-202, and then configure the Torpedo’s power amp simulation to mimic as close as possible the tube configuration of your amp. However, the VM-202 isn’t a load box, so you’ll still need to have a speaker connected to your amp, which may be find in your studio but not so fine in your home studio. Another solution for the traditional amp user is to get a load box such as the Torpedo LB-202, THD Hotplate, or Rivera Rock Crusher. Then, you can either use your effects loop Send to pair your amp’s preamp section with the VM-202’s flexible power amp section, or you can use your amp’s full tone by taking a line-level signal from the load box into the VM-202, and then bypass the amp simulation, just using the Torpedo for its great cabinet and mic simulations. The Suhr ISO Line Out device is perfect if you want to use the VM-202 strictly for its cabinet and mic modeling. It taps the output of your amp and sends a full amp tone (at line level) to the VM-202, while passing your amplified tone through to your speaker cabinet without any attenuation. If you want to use the VM-202 for front-of-house sound as a cabinet simulator and thus avoid dealing with mics on your cabinet, this is a great approach. You can still use your amp and speaker cabinet for stage volume. If you need to use your effects loop for actual effects, you’ll want to place the VM-202 after your effects but before the loop Return, and place a small mixer in front of the Torpedo (post effects) so that the tone can be split to the VM-202 and returned to your amp. The user interface on the VM-202 is very straightforward, but a bit awkward to use at times. We found that the controls (buttons and knob) for scrolling between and selecting features like amp, speaker, and mics worked in a backwards direction from how we expect selections to work. More than a few times, we found ourselves inadvertently canceling out of certain changes we were making. Other than our subtle feeling of dyslexia, it was easy to set up two simulations within the VM-202. For a stereo rig, this let us build some complex tones. Because each model only allows for placement of a single mic, we were able to run our preamp into two amps (left and right) and place a dynamic condenser mic on one cabinet and a ribbon mic on the other. If you dream of the classic L.A. sound with a Marshall amp on one side and Mesa/Boogie on the other, you can dial in an EL-34 amp on one side and 6L6 on the other, etc. There was no confusion when dialing in our sounds from the Torpedo Remote software. This application worked easily on our Macintosh computer (a Windows version is available, too), and it made simple work of experimenting with, and saving, different settings. Working with a stereo rig we feared that setting up similar dual paths would prove tedious, but copy buttons in the interface let us instantly copy settings from one section of channel A to the same section of channel B. The post-miking effects can save you some processing power in your DAW when it’s time to record. Two Notes incorporated the most useful channel strip features that engineers are most likely to reach for to make a guitar tone sit nicely in the mix, saving you from loading up a bunch of additional plug-ins at mix time. It was easy to dial in just the effects we wanted, or bypass them completely. Two Notes have modeling technology down cold. They blew us away when the Torpedo products were first introduced at Winter NAMM 2010, and now that we’ve spent a month with the VM-202 in our studio, the love affair remains strong as ever. This studio tool delivers the goods — it sounds and, more importantly, feels, like a real tube power amp. Each of us who played guitar through the VM-202 was extremely impressed. If we were to record with this unit, nobody would ever be the wiser for it, and as a solution for performing live with nothing more than a preamp and a set of in-ear monitors, the wedding band guitarist can actually enjoy big tube tone without upsetting the more sedate members of his/her entourage. It would be impossible to go into details regarding which amp sounds best, which mic simulation is most authentic, etc. Because you can configure the amp topology however you like, mix and match speaker cabinets, then change the placement of the mics, and then apply post-mic processing, the range of sounds is staggering. The one thing that you can’t do is nail your guitar amp’s exact tone, because while the VM-202 is modeling power amps, it is delivering amp tone of a unique origin. If your amp has special tonal characteristics such as diode vs. tube rectification, for example, there is no control over this. Instead, consider the Two Notes power amp to be a unique power amp, just as Carvin’s rack power amp is different from models from Mesa/Boogie or Freyette or Marshall. But unlike the numerous power amps on the market, the Two Notes power amp is uniquely flexible in its tone shaping abilities. You can get lost for days or weeks exploring different power amp and cabinet/mic sounds. With a preamp you know and love, you’ve never had so much flexibility to easily explore the difference that different power sections make on your tone. We got dark, immediate, and clean response from 6L6 tube designs while the EL34 models gave us bright tones that got dirty very easily. If you like that subtle break up on the clean channel of your Vox or Fender amp when hit hard with loud pickups or an overdrive pedal, you’ll get that response. Roll off the volume and the amp cleans up nicely. With our ENGL e580 preamp, we were able to get great tones well suited to the variety put forth by this versatile preamp, from super clean to super heavy. It was especially nice was how we could get extremely heavy tones for playing metal with a very low noise floor. In the case of a Mesa/Boogie Triaxis preamp, we could replicate the tone of a Mesa Simul-Class amp better than with any other technology available by running our signal through one 6L6 amp configured as Class A and other as Class AB and blending the results to taste — independent control over the left and right outputs made this easy. Although we didn’t have time to pursue testing with any bass preamps, we have no reason to think this technology would be any less fantastic. Numerous bass cabs — and mics suited to recording bass — are included. The onboard five-band EQ is fixed, but we were able to adjust the low-pass filter anywhere between 10 Hz and 500 Hz. The EQ was quiet, and used creatively it made a huge impact on our tone, especially playing with its midrange frequency. 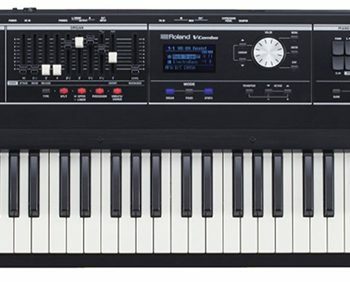 Documentation for the VM-202 was well written and informative, and all MIDI CC information was clearly presented for configuring studio control over the VM-202. We would have liked to see some discussion of the virtual power amp circuit design, and including a reference chart for speaker and mic models and the actual items modeled would have been a handy reference. The Torpedo VM-202 (MSRP $2,650) sells for $1,995 through its US distributor. While not cheap enough for every “serious but casual” musician to get his/her hands on this device, it’s a reasonable price for a solid piece of gear for the studio, and that’s an environment where this device happens to really shine. There is no other product on the market providing this unique combination of power amp, speaker, and mic emulation.